The demand and opportunity for cross-cultural technology design is rapidly rising due to globalization. However, all too often resulting technologies are technically usable, yet cannot be immediately put to meaningful use by users in their local, concrete contexts. Support for concrete user activities is frequently missing in design, as support for decontextualized actions is typically the focus of design. 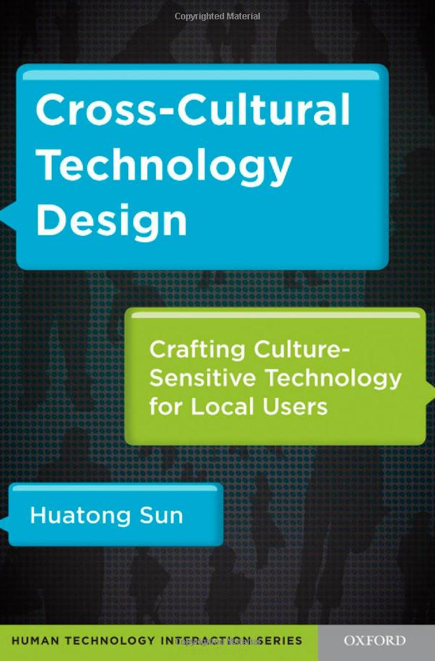 Sun examines this disconnect between action and meaning in cross-cultural technology design and presents an innovative framework, Culturally Localized User Experience (CLUE), to tackle this problem. Incorporating key concepts and methods from activity theory, British cultural studies, and rhetorical genre theory, the CLUE approach integrates action and meaning through a dialogical, cyclical design process to design technology that engages local users within culturally meaningful social practices. Illustrated with five in-depth case studies of mobile text messaging use by college students and young professionals in American and Chinese contexts spanning years, Sun demonstrates that a technology created for culturally localized user experience mediates both instrumental practices and social meanings. She calls for a change in cross-cultural design practices from simply applying cultural conventions in design to engaging with social affordances based on a rich understanding of meaningful contextualized activity. Meanwhile, the vivid user stories at sites of technology-in-use show the power of “user localization” in connecting design and use, which Sun believes is essential for the success of an emerging technology like mobile messaging in an era of participatory culture. This book will be of interest to researchers, students, practitioners, and anyone who wants to create culture-sensitive technology in this increasingly globalized world that requires advanced strategies and techniques for culturally localized, participatory design.